[pdf document, Philip J. Landrigan, M.D. Environmental Health Perspectives Volume 109, Number 11, November 2001] After a brief summary of the main health effects of the WTC tragedy, this editorial describes research projects already initiated to track these effects and calls on the relevant government agencies to conduct long-term research. 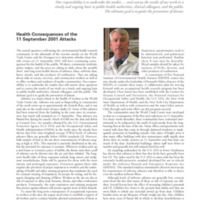 “Health Consequences of the 11 September 2001 Attacks; Editorial,” September 11 Digital Archive, accessed April 25, 2019, http://911digitalarchive.org/items/show/2941.